The feast of the Nazareno and " las Mortajas"
How would you feel about carrying your own coffin (casket) through your local town or district, aided and abetted by your friends and family and watched by the rest of the community? Well that is exactly what happens during A Pobra do Caraminal's unique and bizarre September procession known as "las Mortajas". This elaborate procession takes place as the "high point" of the "fiesta or feast of the Nazareno". Put simply, what happens is a member of the town is given the "honour" of being chosen as the "romero" and a coffin is built specifically for him. He then selects, from friends and family, poll bearers and both he and they make the procession of "las Mortajas" through the town during the feast of the Nazareno. The individual selected as the "romero" is supposed to be someone who, in some manner, owes their life to the intervention of Christ. In taking center stage in this ceremony, the "romero" offers his own life back to God in payment. In case you were worrying, the "romero" is not ceremonially slaughtered at the termination of the celebrations, or at least I don't he is. The festival is well known throughout the area and generates many visitors from neighbouring towns and villages in September. Whilst none of A Pobra's other fiestas quite compare with the ritual of "las Mortajas", they are still important in the communities timetable and are listed below. As is common amongst the smaller communities of Galicia, the religious celebrations of "Corpus Christi" result in an important fiesta and in Pobra do Caraminal floral displays are the main visual feature you will see. The rounding up, corralling, branding and main trimming of the wild horses that forms the "Curro das canizadas" festival is also celebrated in Pobra do Caraminal. In August two further fiestas, popular throughout Galicia, take place and they are, the "feast of the Virgin del Carmen" and the "feast of San Roque". 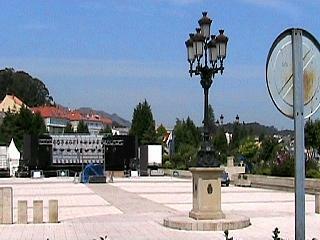 Since we don't currently have a photo of the fiesta celebrations, here is a picture of the alameda with a large stage at the far end awaiting the production of a Galician ballet later that same evening. Finally, as with all our town and city guides, if you visit Pobra do Caraminal and have an opinion, good or bad, let us know and we will add it to the page in question.